Parts marking, kitting, and packaging provide benefits, too. 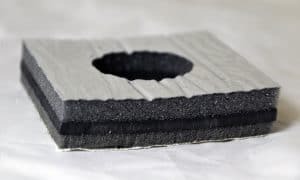 By taking a closer look at how custom-fabricated cab insulation is made, you can determine if it’s the right choice for your company. Engineers are experts in their fields but may be pressed for time across multiple projects. An insulation fabricator who offers design assistance can serve as an extension of your engineering team. 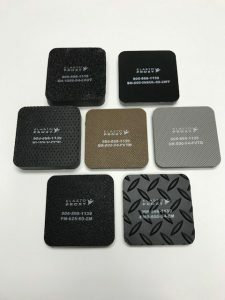 The right manufacturing partner can also help with material selection. 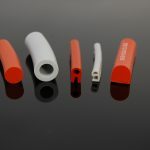 Typically, cab insulation like headliners, door panels, and side panels are made of perforated vinyl foams that are between 1/2” and 1” thick. Material type and thickness aren’t the only design considerations. In a crowded marketplace, mobile equipment manufacturers need distinctive products. Custom cab insulation can match your color scheme and have a basket-weave pattern or texture. Perforated vinyl foams come standard in black, gray, and Mojave brown, but custom-color matching is available. Some foams even have a metallic finish. Some mobile equipment manufacturers still cut cabin insulation by hand. Typically, installers use a cardboard template and a utility knife or box cutter. Manual cutting might seem less expensive than water jet cutting, but poor-quality cuts can produce significant material waste. If installers toss mis-cut insulation into the trash, managers may never know a job’s true material usage. 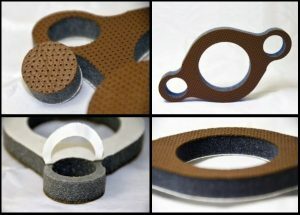 Water jet cutting lets you buy only the material that you need. Plus, because it’s automated, water jet cutting is repeatable. Unlike an installer who makes the right cut in the morning and the wrong cut in the afternoon, water jet technology produces the right cut every time. There are no templates or hand tools either. Water jet cutting uses your CAD files and is a tool-less technology without blades that get dull. Quality improves, too. 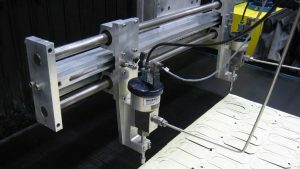 Water jet cutting can create smooth, straight lines or chamfers with 30° or 45° angles. Angled cuts for wrap-around edges provide a finished appearance. 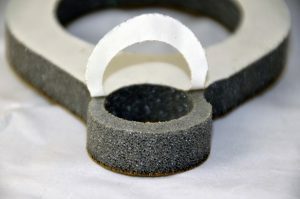 Through-holes for fasteners support the use of fire extinguishers, net pockets, first-aid kits, and other cabin components. Blind holes in the back of the cab insulation are hidden from occupants and support flush mounting. Mobile equipment manufacturers who install cab insulation by adhesive spraying face several challenges. These companies need to comply with health and safety regulations and perform time-consuming setup and cleanup activities. 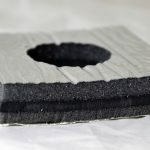 If the adhesive is wrong for the application environment, the insulation may peel away from the cabin and require rework or repairs. Custom cab insulation that attaches with pressure-sensitive adhesive (PSA) tape offers an alternative. Whether on the assembly line or in the field, an installer peels away the backing material and attaches the insulation to the cabin surface. For headliners, PSAs that support heavier weights are available. Insulation fabricators can also suggest PSA tapes for specific temperatures and humidity conditions. Parts marking, kitting, and packaging can also save mobile equipment manufacturers time and money. Inkjet printing and UV drying produce parts with letters and numbers that are easy-to-read for fewer picking errors. Parts that are kitted and packaged into a single box also speed assembly times. Instead of looking for different SKUs in a warehouse, an installer can just open the package and get to work. 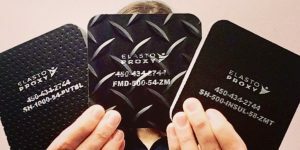 Elasto Proxy custom-fabricates cabin insulation for mobile equipment. In addition to water jet and abrasive water jet cutting, we provide taping, parts marking, kitting, and packaging services. Our technical team also offers design assistance and help with material selection. 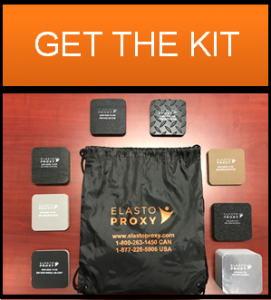 For samples of our mobile equipment insulation, ask for The Elasto Bag. Just click this link to get started.